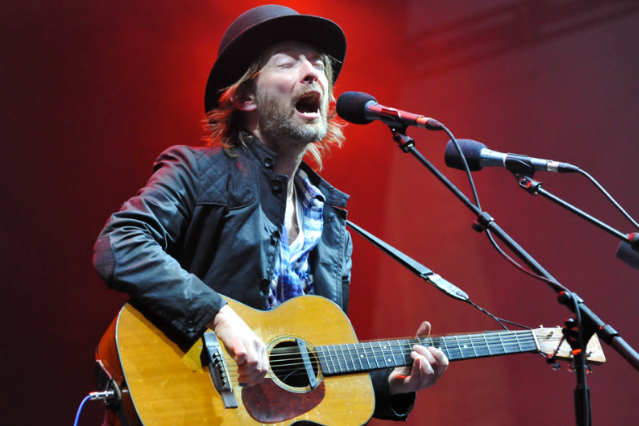 Now that Radiohead’s pair of headlining gigs at this year’s Coachella are wrapped up, it’s a decent moment to reflect on Thom Yorke’s other band, which performed there in the desert a couple of years ago. Ever since that brief 2010 tour, details have been scarce about Atoms for Peace, Yorke’s side project with Red Hot Chili Peppers’ Flea and Radiohead producer Nigel Godrich, although the recently ponytailed frontman allowed late last year that the star-studded group had almost finished an album. On Friday night, as Radiohead At Ease notes, Yorke and Godrich put on a DJ set under the Atoms for Peace name as part of the Beasties Boys member Mike D’s Transmission LA: AV Club festival. Although the set included at least five songs that appeared to be new, footage of the performance raises more questions than answers. One of the attendees at the event, held at MOCA in Los Angeles, can be heard shouting, “All my friends are here,” but it’s even tougher than usual to make out Yorke’s murmuring vocals — though we think we can discern an “in the future” here and there, and what might be “possess me” someplace. Then there’s the music, which in its combination of icy electronics, skittering percussion, and drifting keyboards certainly sounds like a typical 21st-century Yorke affair. But if this music is Atoms for Peace, where’s Flea’s famously funky bass? Are these club remixes? What’s going on here? Further adding to the mystery was the fact that the DJ set followed the premiere of a new exhibition featuring work by longtime Radiohead visual artist Stanley Donwood. Titled Lost Angeles, the show runs through May 26, and as TKOL Part 2 points out, the artwork is similar to the Atoms of Peace logo; Godrich himself tweeted a photo of some of the art. So while nobody really knows for sure what that music was that Yorke and Godrich unveiled over the weekend, we do know they played it (a) under the Atoms for Peace name and (b) that it was related to an art show by Radiohead’s favorite visual collaborator. Whether that means we’ll actually be hearing these songs in some form on a new Atoms for Peace record — perhaps with Lost Angeles-like art on the cover? — is anybody’s guess. And these guys have been known to surprise us before.